I was fortunate to have my husband keep the kids so I could go to Weight Watchers last night. I gained 5 pounds. Yeah, I ate at a party and yeah I had a birthday dinner – but five pounds. I was surprised. I’m not usually surprised. So, back to the grind and I am hopeful for a double loss next week. Since we didn’t have a meeting to do to this morning, the kids and I got my son’s glasses fixed. This is how they looked when we left the house. We didn’t really have fixing glasses on the agenda, but little sister likes them way too much. 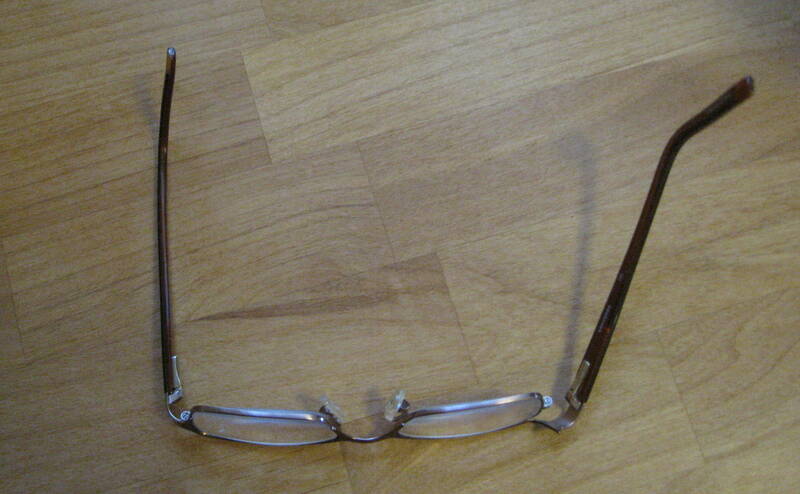 The eye glasses store put the existing lenses in new frames – for $25. I’m glad we have the protection plan for the 2nd time. Yeah, this is his 3rd pair of glasses in less than a year. Since the new Kid Kare space opened at the JCC, I have the option of working out in the afternoon. So, we headed to the JCC around 3:30pm today. I did my 30 min C25K run/walk and then an hour long BOSU class. The BOSU classed really kicked my behind. I’ve taken the class before and I didn’t think it was that tough, but I must have been dreaming. I’ll be keeping it in my schedule so I can work up to feeling energized instead of beat when class ends. Next up: I was going to spin, but will see how I feel in the morning. Nice seeing you today at the J! I’m glad you had a good workout and don’t worry about those 5 pounds, just focus on your NeXT workout session.